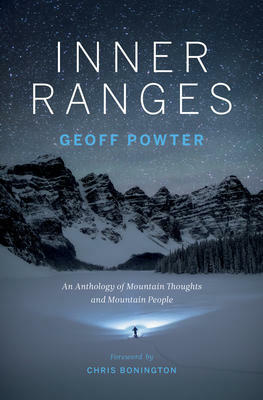 Inner Ranges: An Anthology of Mountain Thoughts and Mountain People is a collection of mountain-inspired pieces written throughout Geoff Powter’s thirty-year career. The book guides the reader through his life’s journey as he explores mountains and mountain life, enriched by his own reflections and personal development (12). 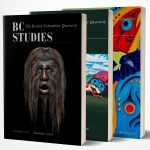 As a former editor for the Polar Circus magazine and The Canadian Alpine Journal, Powter’s incorporation of twenty-six pieces of mountain adventures, tragedies, conflicts, and fulfillment creates the portrayal of mountains as cultural and environmental landscapes molded by the people and animals within them. With an emphasis on physical pursuits in Canada’s mountains and the Himalayas, Powter carefully incorporates stories of exploration with stories of conflict and tragedy to draw the reader into the inner world of those seeking refuge within mountains through a physical connection. Returning from the 8000-metre peak of Manaslu, Powter undergoes a realization that his mountain world feels different from the busy popular hiking trails below full of “people from the other world” (68). Those outside this mountain life see the beauty of the large mountains and miss the conflicts and tragedies caused by mistakes and arrogance. Powter draws attention to issues specific to this mountain world – where climbers are injured or killed because of carelessness, unending desire to reach high places, pursuit of fame, and lack of human compassion. While reflecting on this, he states, “the big mountains aren’t always the most noble of places” (67). Historically, treacherous and inaccessible peaks were valued as masculine spaces that only some could conquer. Glaciers and valleys became demasculinized areas that were easier achievements in comparison to the high-altitude climbs completed mostly by men (Reidy, 2015, 163-4). Other narratives seek to contest this idea of “heroic masculinity” (Bayers, 2003, 1-2). Powter challenges the value of physical achievements through his examination of the mountain world. He acknowledges his own desire to reach high places but argues that these desires should not come at the price of safety. Powter’s pursuit of mountain climbing has led to his exploration of other aspects of mountain cultural and environmental landscapes; he eventually “became just as interested in the walk to a climb as [he] was in the climb itself” (94). His investigation into the deaths of wild horses in central Alberta showcases a ‘hidden’ aspect of mountain life that is filled with contestation and outrage. While some believe these horses damage the ecosystem, others argue their populations are maintained by large predators and limited evidence exists indicating they displace game animals (102). Powter’s collection of pieces is an intriguing examination of the thoughts and lives of those connected to the mountains. Drawing on his experiences, he weaves together a collection of stories – the result shows the evolution of Powter himself within the mountain landscape. The strength of his story is the sharp contrast of the physicality of mountains with his own self-reflection and transformation as a result of time spent within these landscapes. The stories portray an evolution of those who seek out these places for physical achievement and pleasure and leave with a deep appreciation, respect, and admiration for mountains. Bayers, Peter L. Imperial Ascent: Mountaineering, Masculinity, and Empire, 1-15. Boulder: University Press of Colorado, 2003. Reidy, Michael S. “Mountaineering, Masculinity, and the Male Body in Mid-Victorian Britain.” Osiris 30 (2015): 158-181. Victoria: Rocky Mountain Books, 2018. 360 pp. $22.00 paper.